Now in store #TheMeshProject body appliers and two exclusive faces: Felix and Rays II. Please be aware that this release is intended for owners of #TheMeshProject (BETA) Head(m) – (Deluxe) and #TheMeshProject (BETA) Deluxe Body(m) only. If you haven’t this product already please refrain from purchasing this applier since we are *not* providing system skins within this release. 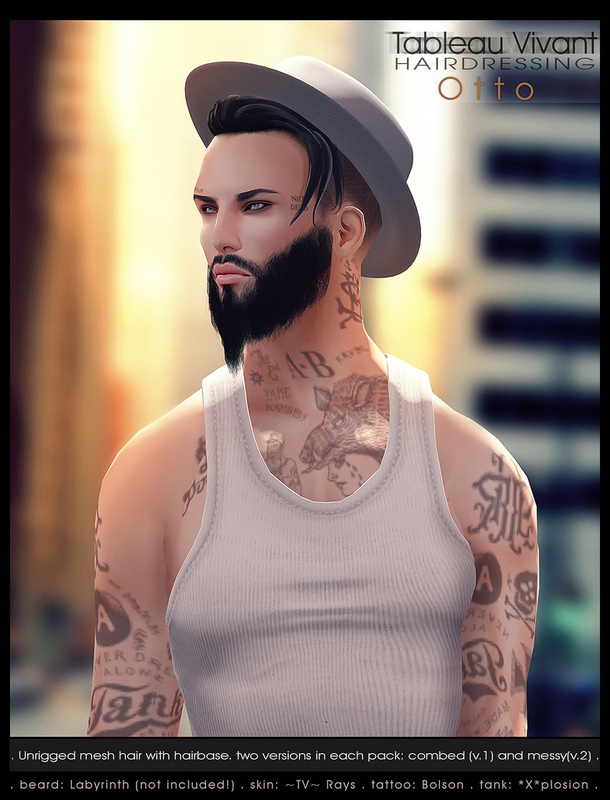 If you are interested in system skins (to wear on the default avatar of Second Life) please try one of the previous releases in the back of the store. Dark brows, blond brows, red brows and no brows. – 1 applier in the purchased skin tone. Body appliers and faces are sold separately. We are working on more layers such as standalone eyebrows, facial hair, make up, hairbases and so on. Tints are compatible with both our most recent system skins (new body) and #TMP body appliers. It is with much respect and hope that Glam Affair and Tableau Vivant join Leaf On The Wind, along with many other wonderful designers, to help this courageous young lady fulfill one of her dreams. Tableau Vivant created a style named after Ms. Chandrayaan’s first life name, Amy. Glam Affair has Sia available in Artic tone, in 5 different makeup options available at LotW. Both are available exclusively at Leaf On the Wind. Another round of Collabor88 and as always, Tableau Vivant is super excited! Theme is OMG Unicorns and it was a lot of fun to work on. Okay, enough talk – now on to the the oh so important part of HAIR! Tableau Vivant released two new hair styles for the event., Celestia and Cadance. Both are shoulder length styles with big and luxurious waves. Celestia and Cadance are ethereal and magical sisters, with Celestia being a bit more of the wild spirit with a lovely side braid. Perfect styles to wear with your favorite unicorn accessories! Both are non rigged mesh hair, mod and with a XYZ resizer. And as always, we have 11 hud Color Options with 30 Tints in each – Sold Separately. If you fatpack there is a bonus hud! For undelivered Tableau Vivant purchases please visit our redelivery terminal in Main Store. Tableau Vivant has a few new things to share with you all. First up – Neve II. We have released a no hat version due to many of your requests ever since we first introduced Neve. Now finally you can have Neve II. Long, flowing and no hat! 􀀄Neve II is a unisex style, comes in two sizes in each pack and is rigged. Each pack also has – 1 HUD with 30 tint options . Next is Otto, available at TMD. Otto is hairstyle with fedora (10 colors) and tintable hairbase included. Two versions in each pack: combed (v.1) and messy (v.2). Last but not least; Keiran. A long unisex style that is available at We ❤ RP. Suggested by our friend Aydan Darcy, .H.o.D. owner and creator. To him the credits for the name as well, which means dusky, dark-haired. Each pack contains 2 rigged mesh hair. One optional tintable hairbase (please refer to the notecard on how to tint it properly) and 1 HUD with 30 tint options. All hair styles have 11 Packs with 30 Tint Options in each. If you fatpack, there is an additional bonus hud. If your hair does not deliver, please do not double purchase. Visit our redelivery terminal in the main store.